In the WordPress SEO theme I develop there’s an advanced SEO feature to make the most out of internal links anchor text in the new Google Hummingbird algorithm. If you are looking for general anchor text info, see my anchor text optimization tutorial. In short Google only counts the anchor text of the first link to a unique URL. What this means is if a web page has two or more links to the same URL only the first links anchor text is counted as anchor text (it’s still indexed by Google as standard body text). It’s essential SEO wise to have the first link (as found in the code) to use your best optimized anchor text since others are ignored, UNLESS you use an advanced SEO technique so all links anchor text is counted. First let’s prove the SEO problem with anchor text exists. 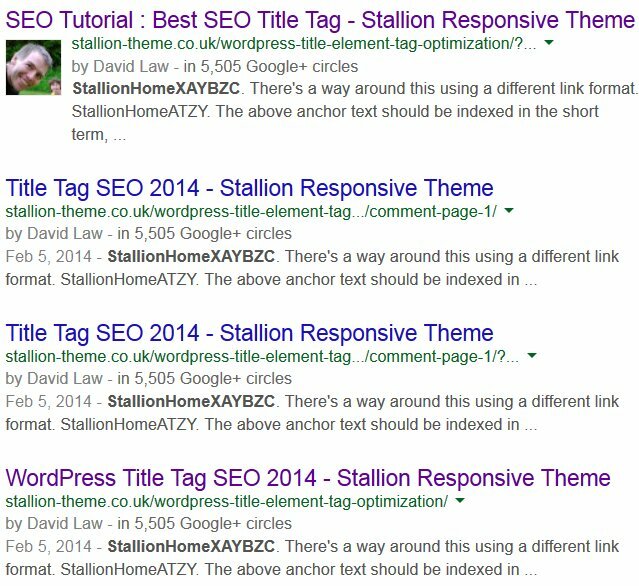 I created a WordPress comment with text links back to this sites home page with different anchor text, because I use the Stallion Responsive theme larger comments generate post like pages (I call them Stallion SEO Super Comments Pages) and the links are dofollow. The SEO super comments pages are a major Stallion theme SEO feature, you would not believe the extra Google SERPs the indexed SEO super comments pages generate. Anyway, the SEO test comment is at Best SEO Title Tag and the SEO super comment page at Best SEO Title Tag SEO Super Comment. Not going to mention the SEO test anchor text here because it makes future SEO analysis more confusing (this page would rank for the unique made up keywords). Go to the links above to see the made of words and use them to search Google for the pages indexed for those made up keywords. I changed the anchor text of the code above so it didn’t mess with the SEO analysis. The important part of the search result is the home page is NOT ranking for this made up keyword. This is important SEO wise because as you’ll see in the next Google SEO test search result Google does rank a page just because a link to that page includes the phrase as anchor text. The above SERP proves Google has not counted the made up keyword as anchor text, it’s read the links anchor text as standard body text which is why there are 4 results. There’s a little used SEO technique (linking to a link anchor) for forcing Google to count the anchor text of a link and it’s really easy to use. 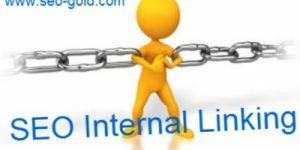 Simply by adding #something (that’s linking to a link anchor called “something”) at the end of a link URL Google will index and count the anchor text as a ranking factor for the page the link is pointing at. The third link on the comment pages I linked to earlier has that sort of link. As you can see the only difference between link 2 and link 3 is link 3 includes #stallionhome at the end of the URL. If you are a Stallion Responsive Theme user and want this feature turned on it’s under the “Stallion Theme” >> “SEO Advanced Options” : “Stallion SEO Links Plus”. If you are familiar with anchor text optimization you will already be aware a web page can rank for SERPs that are NOT on the page in anyway just by linking to the page with anchor text you want a page ranked for. When the world discovered this we had a lot of fun with what were termed Google Bombs, if you had a beef with a website you could get it ranked for derogatory terms just through anchor text usage. Google has since altered it’s algorithm to reduce Google Bombing, but the principal SEO value still remains, by linking to a web page with anchor text that is not present on the page it can rank in Google just because of the anchor text of incoming links. Surprisingly the Google “Computers” SERP used to show both Dell and Gateway computers websites ranked high despite the companies not using the word Computer within the body text. Did a quick check and both Dell and Gateway now use computer/Computers on the page, but Acer (currently ranked 20th for the Computers SERP) does not. 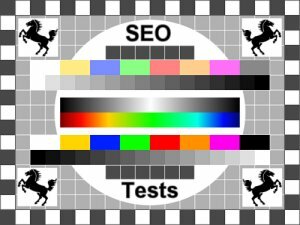 Anyway, back to the SEO testing results. The only reference this sites home page has for that made up keyword is the third test link. The above Google SERP proves Google is counting the made up keyword as an SEO ranking factor for the homepage SERPs. The made up keyword does NOT exist on the home page: it’s not part of the body text, images or anything. If Google didn’t pass ranking value through the anchor text the home page would not be ranked for the made up keyword. I think you’ll agree this is conclusive proof Google ignores the second links anchor text, but counts the third links anchor text because of the simple addition of #something to the end of the URL. This is very important WordPress SEO wise because WordPress themes will inevitably add multiple links to the same URL from various widgets etc… when I publish this article it will gain a link from the Recent Posts widget. 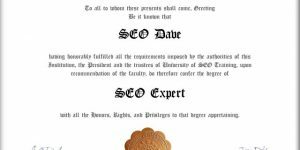 If you look at the SEO Tests category this article is archived within it will contain 5 links to here. Yes, 5 links. One from the Recent Posts widget and four from the archived snippet of this article: one of the links is from the title of the article, another from the thumbnail (alt text which is the same as anchor text), another from the Continue Reading link and the last from the Comment link. 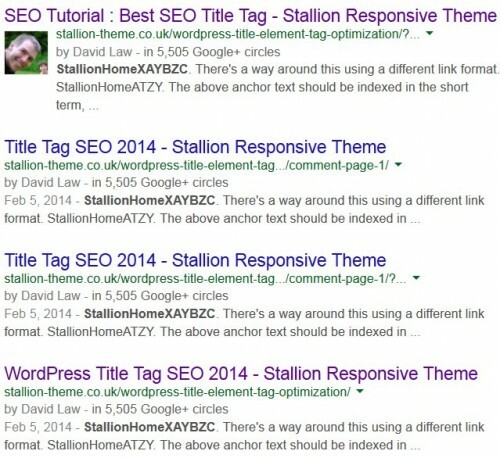 If I were using a standard WordPress theme only the first link in code would count it’s anchor text, because I use the Stallion Responsive theme which takes all this into account all 5 links count and you’ll note the anchor text is different for the links (theme SEO feature). This is part of a set of theme SEO features which I won’t explain here, the importance of these features is the new Hummingbird algorithm is looking for natural language linking patterns. When someone links to a page they won’t always use the anchor text you want the page ranked for and Google has over the years become very good at determine natural links (that aren’t perfect SEO wise) vs perfect SEO links which Google dislikes. 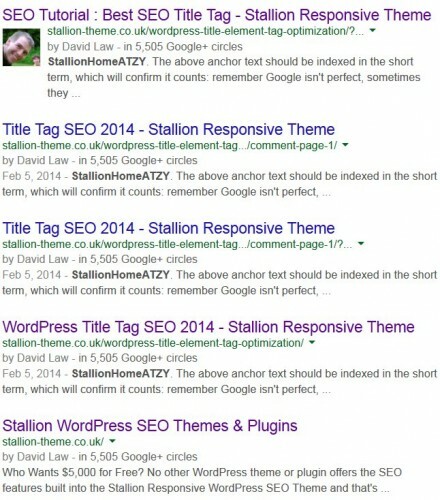 5+ years ago that was terrible, we wanted as many links as possible to use the hardest keyword SERPs we wanted ranked for, if we wanted a page ranked for WordPress SEO Tutorial we’d want that exact anchor text “WordPress SEO Tutorial” for as many links as possible. 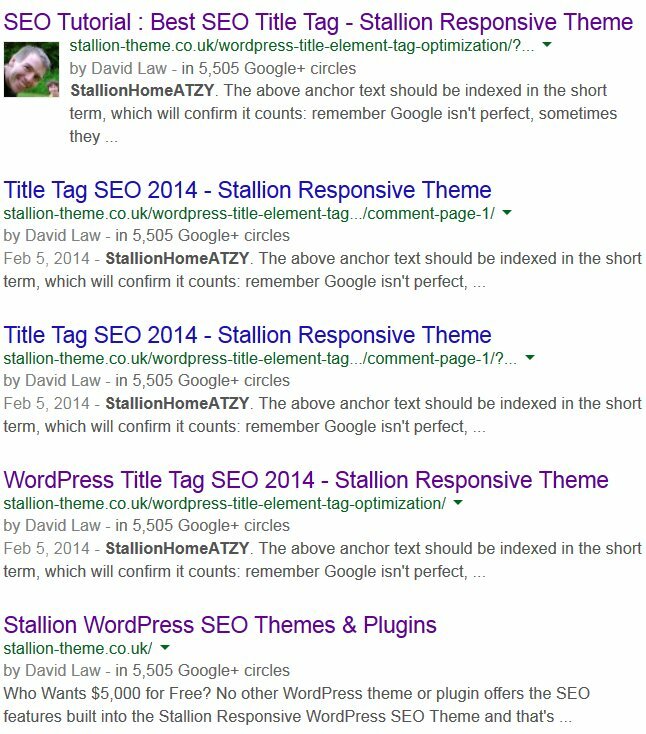 In 2014 that is no longer the case, we now want more natural anchor text links, maybe links with anchor text “SEO tips” or “Here’s some great SEO tips” and Stallion Responsive achieves this with internal links. Below are another two links to the WordPress SEO Tutorial category (we already have a standard text link above), the first SEO test link WweerrdZzPpresz lacks the #something code and won’t be ranked. This second SEO test link wzozrzdzpzrzezss which includes an anchor #footer-widget-area which will link to the footer area of the page will be ranked on the tutorial category page. When this page is indexed and Google re-ranks the tutorial category SERPs you should find the category will only be found for the second made up keyword and not the 1st. Right now (April 2nd 2014) there are no pages found in Google for the above two made up keywords, Google guesses it means WordPress, you can force Google to only show the made up keyword by surrounding your search word with “speech marks”. Update June 15th 2014: As expected this article is found for both of the two made up keywords above (changed the made up words, see below)- add speech marks because Google assumes we are looking for the word WordPress (not ideal made up words in hindsight :-)). This shows Google has indexed this webpage and read the text of the anchor text. What’s interesting is the webpage linked to (the WordPress SEO Tutorial page) is NOT found for either made up keyword, was expecting it to be found for the second made up keyword (the link with the #something added). I’ve changed the two made up keywords to unique ‘words’ that Google didn’t make a suggestion for (not easy to find). This will remove a variable, Google looking for a close match (shouldn’t need speech marks when checking the results). Update September 2014: Now we are using made up keywords that are not being mistaken for mistyped versions of WordPress we are seeing the expected results. The link lacking the #something has it’s anchor text counted as body text on this webpage, but because Google ignores the anchor text of repeated links lacking #something it’s passed no SEO keyword benefit via the links anchor text to the page we linked to. For the link which includes #something we see the anchor text also used as body text on this webpage, but also the anchor text is passing SEO keyword benefit to the webpage linked to as well. Clear proof Google passes SEO keyword benefit via the anchor text of links (not a big SEO revelation, we’ve known this for over a decade :-)), BUT only if a links URL is unique and you can make a link unique by adding #something to the URL. This is an SEO test, testing the rel nofollow attribute. Changed the anchor text 15th June 2014 with current anchor text which currently has zero Google results. Nofollow SEO test will be valid within a month. Been running an SEO test on nofollow links anchor text benefit for years and the SEO results are below. Added a link from a comment: it’s the comment above this one, but used to be on another site (moved the SEO Gold site here), now it’s to another page on this website. This is an SEO test, testing nofollow attribute. The above is a screenshot from when the comment was on the SEO Gold site. Where the made up word “SEOstenchbomb” is the anchor text of a nofollow link to another webpage (where the nofollow link goes wasn’t that important). Since SEO tests are regularly ruined by web scrapers copying content, I’ve regularly changed the test anchor text (it’s no longer “SEOstenchbomb” if you look close. 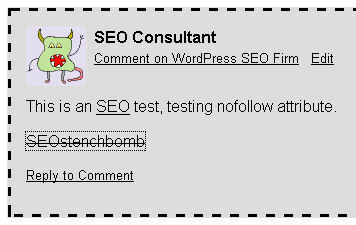 I’m going to keep the rest of this comment using “SEOstenchbomb” as the text we are looking for, but note you’ll need to search for the text in the other comment to see current test results. Google has told us nofollow links anchor text is NOT indexed, it’s supposed to be hidden to Google in every way including the anchor text, the anchor text should NOT be indexed in anyway as anchor text or even body text. A Google search for SEOstenchbomb or “SEOstenchbomb” (with speech marks is useful for SEO tests sometimes) currently (15th June 2014) shows 0 pages indexed in Google. Where the nofollow link is located (the Stallion SEO Super Comment also has the nofollow link). If information provided by Google is correct that the anchor text of nofollow links are not indexed in anyway those webpages should NOT be indexed in Google for the search SEOstenchbomb. I added the #seotests to make sure Google counts the anchor text (Google ignores the anchor text of multiple links to the same URL, adding #anything mean Google will index the anchor text). If Google passes no anchor text benefit to the linked to page it shouldn’t be found in Google for the “SEOstenchbomb” search. Note: rel=”nofollow” links deletes link benefit, for every rel=”nofollow” attribute you add to your website it’s costing you the equivalent of linking out to a random site for no benefit in return. Test SEO update August 2014: Checking the made up keyword in Google shows 3 pages indexed in Google. # https://stallion-theme.co.uk/seo-test-anchor-text/ – The main article for the test comment (nofollow link present). # https://stallion-theme.co.uk/seo-test-anchor-text/comment-page-1/ – A paged version of the above page (nofollow link present). # https://stallion-theme.co.uk/seo-test-anchor-text/?cid=22575 – Stallion SEO Super Comment version of the test comment (nofollow link present). For all three pages above the “SEOstenchbomb” (remember this isn’t the actual test word, check the first comment or at Nofollow Google SEO Test for the correct anchor text to search for) is the anchor text for a rel=”nofollow” link. This confirms Google indexes the anchor text of nofollow links at least as body text. The URL the nofollow link is aimed at: https://stallion-theme.co.uk/wordpress-comments-and-rel-nofollow/#seotests is NOT indexed in Google for the made up keyword. This confirms Google is NOT passing anchor text SEO benefit via the nofollow links (three of them). This could not be a clearer SEO test result. Google indexes the nofollow anchor text for the page it’s on, but not for the page it’s linked to. Thanks for this awesome post. You have done really great job to understand SEO test on anchor text. But still one question playing guitar in my mind. Someone has 1000s of no-follow links out of which 750-800 links coming from Anchor text. As per Google Penguin Update: keyword optimized work will also be in target by Google. Not completely sure of the question, think you are asking about an issue related to Google potentially penalizing a site for comment SPAM? If you haven’t been comment spamming and not received a warning from Google about unnatural links or there’s nothing wrong with the links, disavowing links because you think Google doesn’t like blog comment links or links with good anchor text isn’t a good idea. There’s nothing wrong with backlinks with good SEO anchor text as long as there’s nothing wrong with the links: link farms, buying links, link spamming… those are penalty issues, good SEO anchor text per se isn’t. If you have links with good anchor text because other webmasters like your site last thing you want to do is disavow them. Note the above is based on NOT comment spamming, if you’ve been comment spamming it’s a different story. Google ignores nofollow links, so even though you’ve spammed comments for links Google is already ignoring them. The nofollow links don’t pass any direct SEO benefit, not link benefit and no anchor text benefit: in effect the nofollow links are already disavowed by the owner of the domains the links are on. Google doesn’t have a problem with webmasters buying nofollow links, they advise when buying links to only buy nofollow links. They give the same advise for those selling links as well, so safe to believe Google doesn’t have an issue with nofollow links. If you haven been link spamming I’d be concerned at the links that do pass SEO benefit and what it says about your website. If you’ve resorted to link spamming, what else have you done that’s blackhat, if your backlink profile warrants a look from the Google manual review team it will be a black mark if they find thousands of spamm comments. Since nofollow links pass no SEO benefit there’s no reason to or not to disavow them: from a direct SEO perspective makes no difference. My advice if you’ve had a warning or know you’ve used a blackhat SEO technique disavow all** the spammed links (do follow and nofollow) and if you are carrying a manual penalty make a Reconsideration request admitting the “mistake” and what you’ve done to fix it. If you aren’t carrying a penalty no point making a Reconsideration request, your site isn’t currently carrying a manual penalty. If you have an automated penalty fixing the issue should help lift an automated penalty. ** I’d try not to disavow any do follow links that are particularly beneficial if you aren’t carrying a penalty, you can get away with a small amount of blackhat SEO :-) If you have a penalty be ruthless, they aren’t helping your site.